Amy Houlston at Burgess tells me that, after a brief hiatus, the 43.4m motor yacht Waterlily is now back on the charter market. Designed by Diana Yacht Design and built in 2009 by Royal Denship to Lloyds class, Waterlily is an ideal superyacht for extended cruising and chartering. Most notable are its voluminous interiors and bright, airy feeling enhanced by the generous windows and 2.2 metre headroom throughout. MCA compliant, guest accommodation for 12 is on the lower deck in a full beam master, two doubles and two twins with Pullman berths. Guest areas include a main and upper saloon complete with a range of entertainment systems and extensive teak-laid deck spaces, particularly the sun deck with spa pool, sun pads, sun loungers, seating, wet bar and outdoor television screen. Machined oak is used throughout the interior, which was designed with a restrained, neutral palette by Michaela Reverberi. Waterlily is powered by twin 1946hp Caterpillar engines and has a 3,400 nautical mile range at her 12 knot cruising speed. 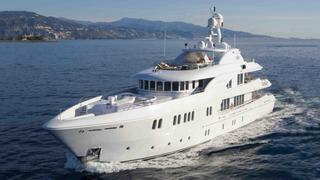 Weekly charter rates in the Mediterranean in summer 2012 start at €168,000 in high season and €147,000 in low season. Waterlily is also listed for sale by Burgess asking €14.95 million.